Thick, nubby sweaters are a hot winter trend, but they can add pounds. 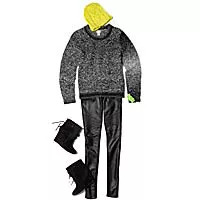 The trick is proportion: If you have a boxy sweater on top, make sure you pair it with something tight and slim below, like black leather leggings or skinny jeans. How can I wear big, chunky knits without looking bulky?